Thank you to everyone for your appreciation of my artwork! This past year was an extremely busy and exciting year for me. I was asked to apply to the Roycroft Association and after applying was accepted. I was honored to be interviewed for the RALA Winter 2019 newsletter. I began taking my artwork to art shows and was overwhelmed by the response and success I experienced. I have had the privilege of meeting so many incredibly nice, complementary people. I completed my favorite series, a group of 4 seasonal paintings based in Yosemite. It has been exciting to see how the interest in my work has grown exponentially. Coming up, I have another show where I will be selling my work in person. You can come see me at the 30th Annual Bungalow Heaven Home Tour in Pasadena on April 28th. I will be at 986 N Michigan Avenue, Pasadena, California between 10 AM and 4 PM. I look forward to seeing you. I have also recently begun my next painting, Rugged Grand Tetons. Introducing Fiery El Capitan ...Now Available! I am excitedly announcing that I have completed my newest painting! 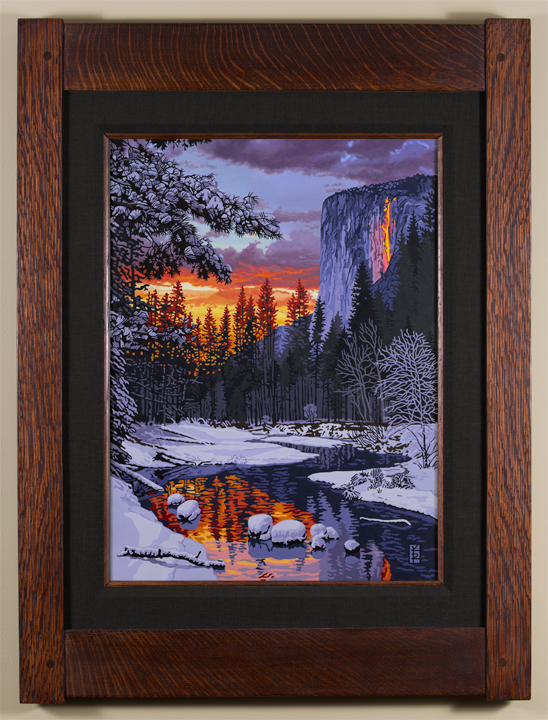 Fiery El Capitan is the 4th painting in my Yosemite Park Series and bears the Roycroft mark on its’ certificate of authenticity. Check with your nearest dealer, as well as this website, for the availability of this beautifully framed giclée print. In talking with customers and retailers, there was a desire for more sizing options to fit an individual's unique needs. As a result, I am now offering all prints with the option of four sizes; Medium, Large and Extra-Large and now Extra-Extra-Large. I trust customers will be able to find a print size that will fit into that special location in their home or office.